Upon the invitation of some food loving friends, I headed to Polk Gulch for brunch. There in the mix with all the Polk Street bars, was Brenda's, a small 'French Soul Food' restaurant. Brenda, the former executive chef at Oritalia grew up in a Filipino-Creole household and started her cooking career in New Orleans. Her menu had plenty of New Orleans favorites such as beignets, gumbo, grits, andouille sausage. And some French items such as a croque and a tartine. The specials board included jambalaya and catfish. We sampled a flight of Beignets, Granola Pancakes, Catfish Sandwich, Creole Veggie Omelet, Hangtown Fry, Cream Cheese Stuffed French Toast. The beignets were a good way to start the meal. Out of the four types, I preferred the crawfish, which were savory and spiced with cayenne. The others were fine, but not as good as the plain ones at Cafe du Monde. Our other starter was the granola pancakes, two giant ones, moist and with granola mixed into the batter. It had the right amount of granola, enough to taste, but no so much as to dry up or take over the pancake. There were a few creamy spots in the pancakes that tasted like vanilla cream, we were not sure whether it was cream or just a slightly less cooked part of the pancake. 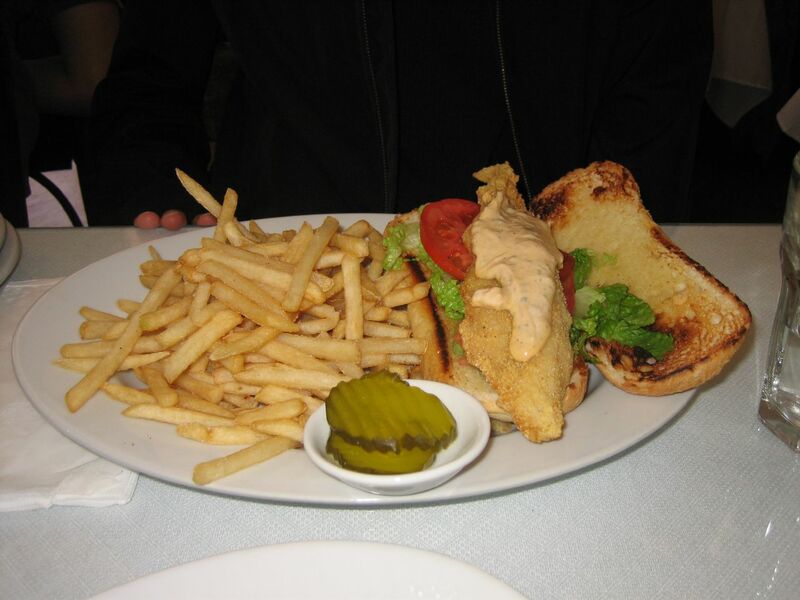 The catfish sandwich was reported to be good and the accompanying fries were cut McD's style. Another friend liked the creole veggie omelet and said that the corn inside was well seasoned, so much so that she didn't need to add the hot sauce she usually uses on egg dishes. 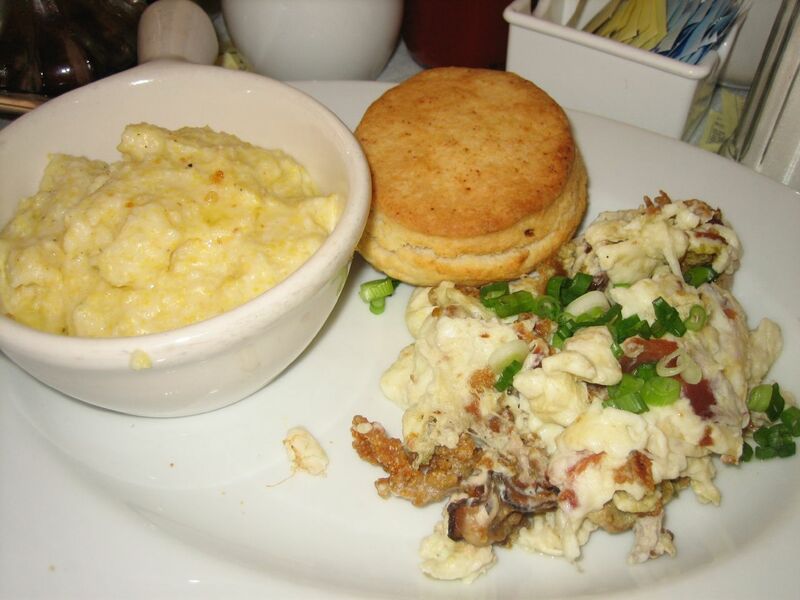 The Hangtown Fry, an egg scramble with bacon, fried oysters and mushrooms was the best of the entrees. The oysters were coated with cornmeal and fried to add a nice crunch to the omelet. Each breakfast entree came with a good biscuit, salty and crunchy on the outside with a soft buttery moist interior. The pot of grits was a little less exciting, very creamy but far too thick for my taste. The only failed dish was the Cream Cheese Stuffed French Toast which was from the specials board. The main complaint was that the plain white bread (wonder bread style) was too thin and flimsy to be topped with cream cheese and then doused with berry sauce. The dining companion that had grown up with Southern food said that using plain white bread was how it would be cooked in the South. So, I guess it was authentic, though not to my taste. As far as the atmosphere of the restaurant, it is casual and cute, but very small. There are about six or seven tables and a counter along the wall for seating. It was full on a Saturday morning and the service was rather slow. It took a while to get coffee on the table, though refills were prompt. I've heard that people line up for the breakfast at Dottie's, this is much better than that, so I can imagine that soon enough there will be a wait on weekends. Overall, I liked the menu and felt the food was of a good quality. I will return again for the food, but wouldn't wait in a long line for a table. Next time I'll try their oyster po'boy or some jambalaya.